Germany is renewing calls for a European solution to the refugee crisis, as Angela Merkel defends her decision to allow in tens of thousands of people. Meanwhile, anti-refugee protests have erupted in largely Catholic Poland despite Pope Francis's call to take in those in need. Germany's vice chancellor is renewing calls for a European solution to the refugee crisis, while Canada has created a $100 million Syrian relief fund. Sigmar Gabriel said in the central city of Hildesheim Saturday that "Germany sees itself in a situation where we are reaching limits," the news agency dpa reported. He added that "the speed is almost more problematic than the number." Some 450,000 refugees have arrived in Germany this year, and the pace picked up in the past week. The country is expecting at least 800,000 this year — the most in Europe. Gabriel said it's important to help the region around Syria and to talk to Turkey, where refugees set off in boats for EU member Greece, about how to slow down the flow. Austria and Germany are at odds with Hungarian Prime Minister Viktor Orban, who rejects proposed Europe-wide quotas for refugees and has drawn criticism for his management of those streaming through Hungary. German Chancellor Angela Merkel says allowing in the tens of thousands of refugees who had piled up in Hungary was the right decision, fending off criticism from a conservative ally. Horst Seehofer, the leader of the Christian Social Union — the Bavarian sister party to Merkel's own conservative Christian Democrats — was quoted as telling the weekly Der Spiegel that the decision was "a mistake which will occupy us for a long time." Seehofer says he sees "no possibility of getting the cap back on the bottle." Merkel said Saturday "we made a decision last week in an emergency situation." She added: "I am convinced that it was right," the dpa news agency reported. Merkel didn't mention Seehofer directly. She said Germany would do justice to its responsibility to help those who need protection. Germany's ministry of defence says about 4,000 soldiers are on standby to help manage the arrival of thousands of refugees this weekend. A senior German official says people are leaving the region around Syria at a "breathtaking" rate, but is indicating it isn't clear whether the influx to Germany will reach 40,000 over the next two days. Thousands of Poles gathered in the rain Saturday at two different spots in Warsaw for opposing rallies: one by radical right-wingers against hosting the refugees and the other in support of helping those in need. The protest rally soon transformed into a march, with protesters waving national white-and-red flags and chanting "Today refugees, tomorrow terrorists!" and "Poland, free of Islam!" Police in riot gear warily watched out for possible violence. The protests came despite a call from Pope Francis urging Catholics to take in refugees. Prison inmates walk along the Hungarian-Serbian border near a migrant collection point in Roszke, Hungary on Friday. 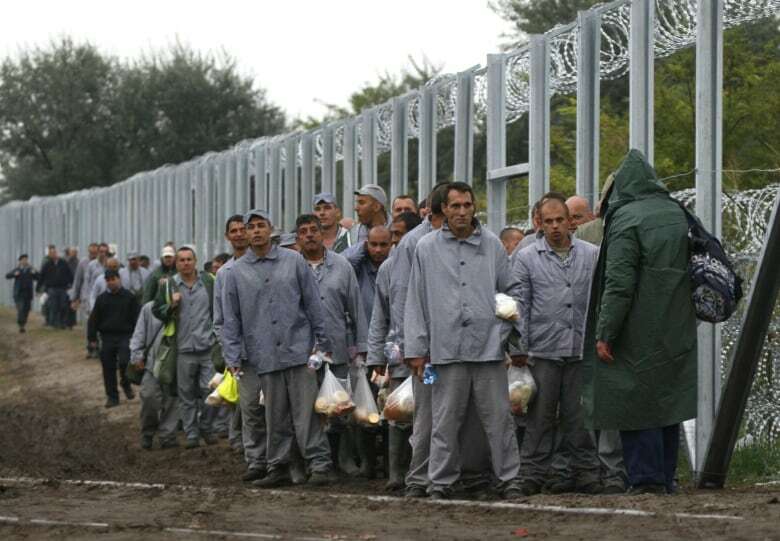 Prisoners are working to complete a 3.5-metre-high fence that is to seal Hungary off from Serbia by October. (David Balogh/Reuters)The spokesman for Caritas, a Catholic charity, voiced resistance to taking in refugees. Pawel Keska told The Associated Press that "it is impossible to follow Francis' gesture in Poland now, because we have no Syrian refugees." Such criticism of the pope may be surprising in one of the most Catholic nations in Europe, but it reflects the general mood in a country with very little ethnic diversity. Many people also argue that the former communist country, despite its recent economic growth, is still far too poor to afford to take in refugees. "First we should take care of poor families in Poland. 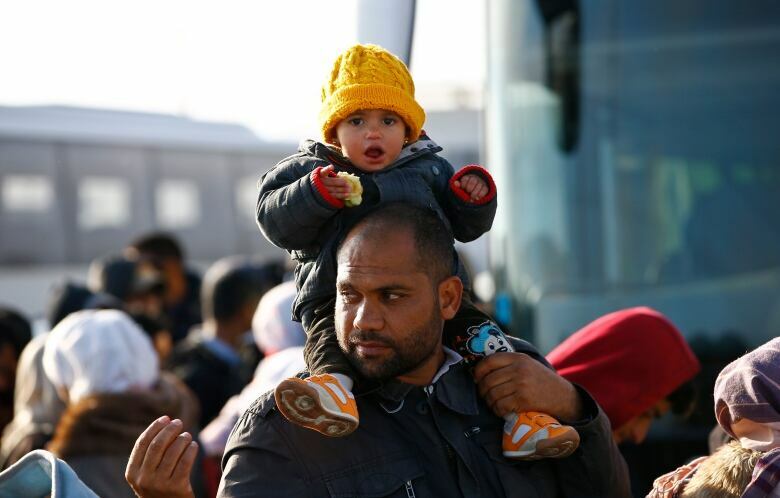 And then, yes, then we can help the refugees," said Monika Kuta, a single mother. 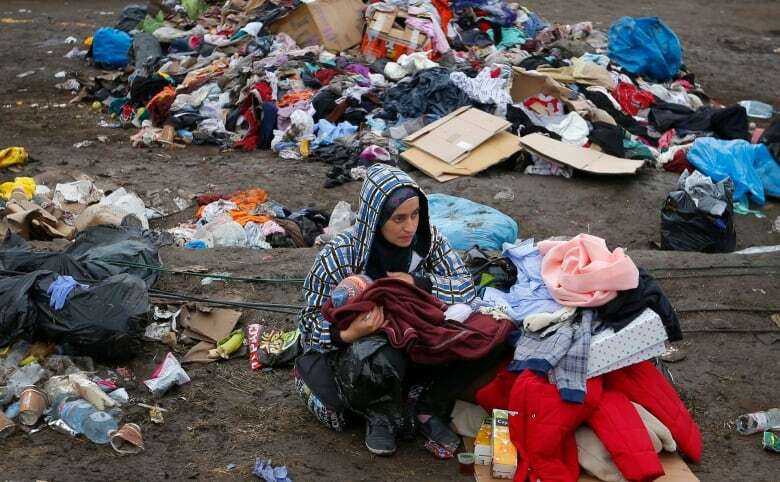 The European Union wants Poland to accept 12,000 refugees. Warsaw has agreed to receive 2,000 within two years and says it has capacity for more provided they are refugees, not economic migrants. A German official says 3,600 refugees arrived in Munich on Saturday morning and a total of 10,000 or more are expected in the course of the day. Simone Hilgers, a spokeswoman for the Upper Bavaria region's government, said that compares with the 5,800 who came Friday. At least two special trains were expected to take some of the refugees on to other parts of Germany. Munich is running short of room to accommodate the arrivals. The northern state of Lower Saxony said it now plans to have trains from Austria run to the town of Bad Fallingbostel, and then distribute the refugees across northern Germany. "It's a mass mobilization here by the German authorities," said Conrad Sauvé of the Canadian Red Cross, who's in Berlin. "They were expecting 5,000 people across the border, and 7,000 came," he said. Many required immediate attention. "I saw many women, many young children, pregnant women, women who just gave birth or about to give birth," Sauvé told CBC News. A UN official on Saturday said one million more people are expected to be displaced within Syria by the end of the year. people within Syria so far in 2015, with intensified fighting in much of the country now in its fifth year of war. The conflict which has killed 250,000 people since 2011 has forced half of all Syrians from their homes, creating 4 million refugees and displacing some 7.6 million more within the country. The 28-nation European Union is divided over how to deal with the influx, with Germany and Austria stressing the right to asylum for war refugees and Hungary in particular arguing that most are economic migrants. Hungary and other eastern nations reject proposed quotas to spread the migrants around the EU. Hungary plans to start enforcing tougher frontier security on its border with Serbia on Tuesday. Asked in an interview with German daily Bild where future migrants should go, Orban replied, "to where they came from." He argued that people coming to Europe from camps in Lebanon, Jordan and Turkey "were safe there" and added, "There is no fundamental right to a better life, only a right to safety and human dignity." Thousands of migrants were expected to board trains for Austria and Germany on the weekend, attempting to exit Hungary before its security fence is completed in a few days time.